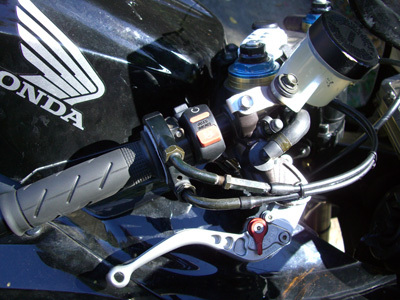 The CBR1000RR has a brake system virtually identical to the '05 CBR600RR with one glaring exception, the master cylinder. 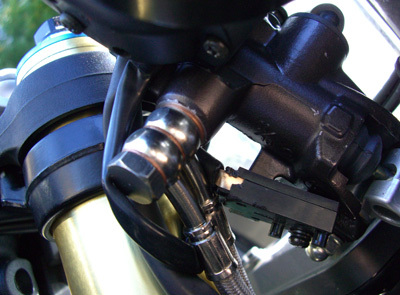 While the master cylinder on the 1000RR is of the new 'radial' configuration, the 600RR retains the longitudinal layout of the past. This was surely done in an effort to keep the costs of the 600 down. 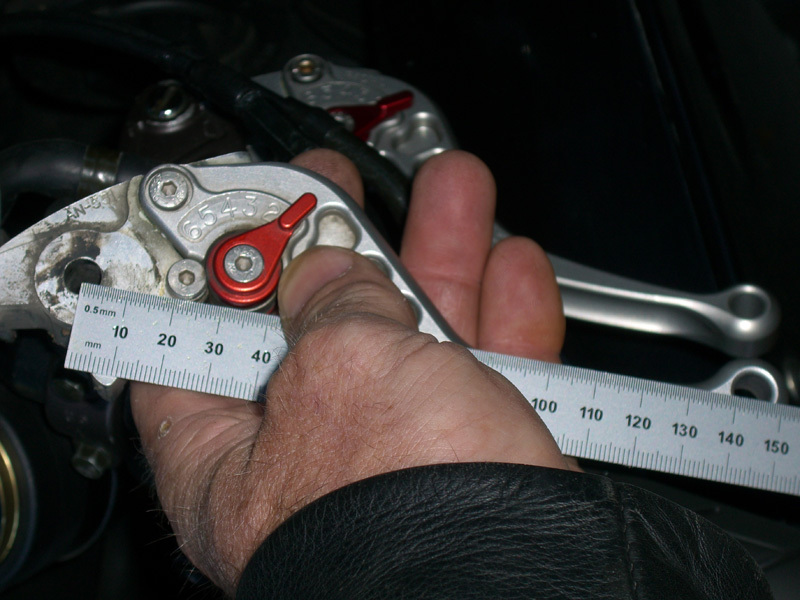 The part inventory needed to get the radial master onto the 600 (without lever) is: MASTER CYLINDER SUB-ASSY., FR. #45510-MEL-006. Crossover parts from the 600RR are BOLT, HANDLE LEVER #90114-MCF-006 and NUT, CAP (6MM) #90201-415-000 and two BOLT, FLANGE (6X22) #90101-MBZ-G00. 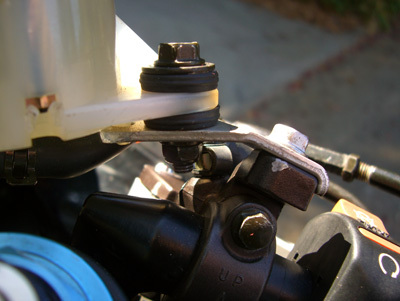 I don't really need the lever since I'm going to be attaching my CRG lever to the unit. All I need to do is order up the CRG lever (RN-521). I had been trolling on Ebay for a while looking to pick one of these up cheap and I was finally able to get a good deal. $25 without the lever plus $6 shipping from a guy that had bought the entire front bake system, but only needed the calipers. At any rate, the master is available from Service Honda for $126.90 and the lever is $26.92, just FYI. So, the cost to put a radial master up front, plus the trick looks of the remote reservoir, is about $100. That is pretty nice compared to the $250 cost of a brembo unit. Even ordering the OEM parts new costs only $153.82, a $100 savings over the brembo. I found that the plumbing is offset oddly. Also, the Goodridge lines that I have on the bike are just too short (from my old F4i). I will have to order some new parts. I ordered up a Galfer 1000RR line kit from Dan Kyle. 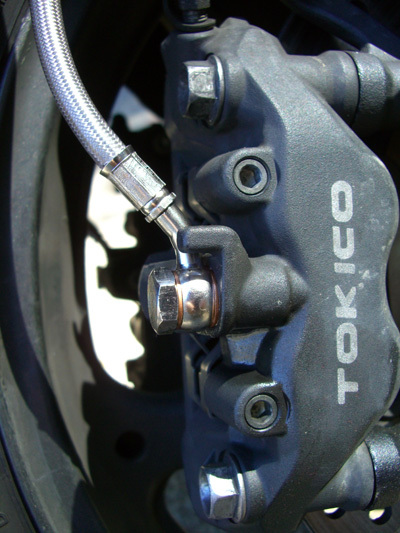 The bore and offset numbers are 11/16, just like the 600RR master. Since the sizes are the same, the feel should be identical, unless the radial configuration truely makes a difference. The hanger for the resovior had to be modified to clear the bodywork, and the install was very difficult to get everything positioned right to maintain use of the brake light switch. My riding impression is simple. This mod was not really worth the money or the time spent on it. I can't really feel the difference compared to the stock set-up with teflon hose. My bike looks more 'race', but who cares. It works no better. The only thing that really changed is the fluid and the master and no noticable difference in performance. 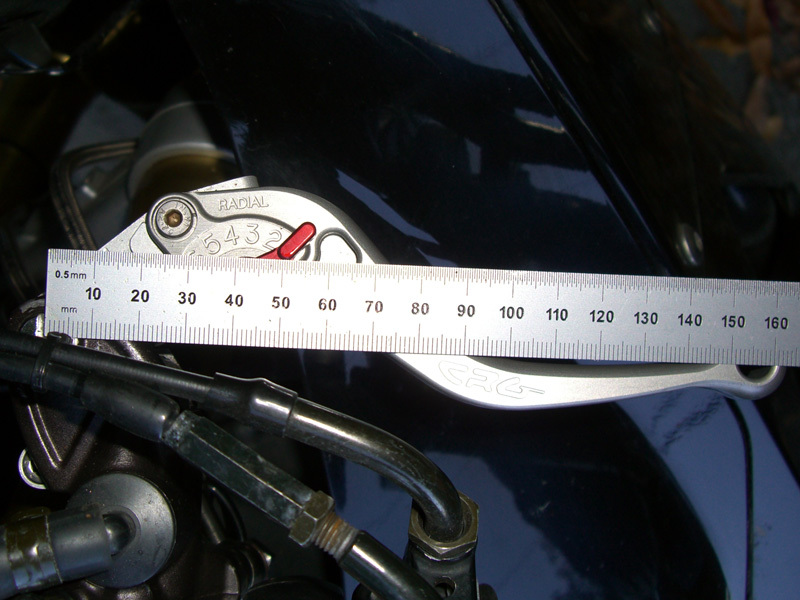 As you can see from the images below, the new lever to pivot length is 155mm. With the stock master and CRG shorty lever, the length was about 145mm. A 14% increase in length! Very nice. BUT, the difference is not that noticeable in normal riding. The brakes worked great to start. Now they work...great.